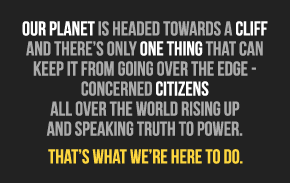 What is Climate Justice? primer is the first in a series. Keep your eyes open! If there’s one lesson we learned loud and clear at this COP, it was how important a role the media plays in determining the world’s perception of the dangerous game being played out in the negotiating rooms. Throughout the COP, misguided messaging was a huge obstacle to a united civil society front. We saw a multitude of messaging angles on each major issue within the conference. Civil society was totally fragmented throughout, even within the same constituency. The youth were running on several different tracks throughout with regards to messaging. It started long before Durban. Headlines whizzed around the world: “The Kyoto Accords are Expiring” (TIME Magazine), “What to do in a post-Kyoto world”, “What next after Kyoto”? The seed was sown, the idea proliferated – the Kyoto Protocol ends in 2012. Developing countries will come together in Durban to negotiate new obligations to renew the KP in a show of their long-standing commitment to the environment and to people’s lives and livelihoods around the world. Very subtle. This sort of messaging was helpful to shape people’s thinking from the start into the idea that any commitment on the part of developed countries would be new and additional, not simply a reinstating of previously made commitments. The Kyoto Protocol does not “expire” in 2012. Its first commitment period simply comes to an end, signifying that by then countries should already have mobilized themselves for a second commitment period. Implicit within the signing of the treaty was the agreement to go forward with successive commitment periods. Developed countries weren’t doing anyone a big favour by coming together to discuss a second commitment period. Once again, they were tooting their own horns for doing only what they had originally agreed to do. A small detail, but a crucial one. Once the idea had been planted into the public mind that the Kyoto was about to expire for good, the next message to get across (from the A1 perspective) was that the purpose of Durban would be to create a new climate treaty. The EU rolled out the EU roadmap, saying they would commit to a KP-2 if it included what they called the Durban Mandate. Suddenly everyone was talking about the new Mandate as if it was the holy grail. The EU spun it as a wonderful thing – they were agreeing to a KP-2! They were going to continue with their commitments under the KP in spite of the cold wind blowing from Canada, Russia and Japan. In the media buzz around the EU’s great plan, the devil in the details was lost. The KP-2 would happen only if all “major emitters” would be involved. The loopholes would remain. The carbon markets would continue. The plan pushed for an 8-year commitment period. This was picked up on by some select media sources, but for the most part, the Great Escape was in the works, its trapdoor built and opened wide by mainstream media messaging that the EU was the ‘bigger man’ and ‘saviour’ of the small island states. But then came the most dangerous twist to the political current of the conference. The blame game began – first against China, then India, then all of the BASIC countries. With bated breath the media (and the rest of the world, fed by the media) waited – would China step up and agree to the new Mandate in order to secure further commitments from the developed countries? Would China and India own their responsibility as ‘major emitters’ and rise to the occasion? Would the BASIC countries sell out the rest of the developing world by refusing to sign this golden Mandate that was in the works? Would China and India sign Africa’s death sentence? 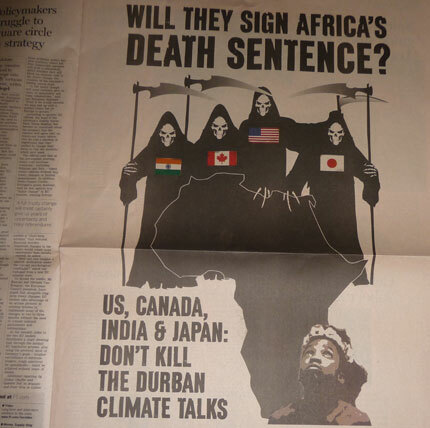 This nearly unbelievable cartoon by Avaaz, depicting Canada, India, the US and Japan as grim reapers looming over a forlorn-looking African child is the exemplification of the most harmful messaging proliferated at COP17. Leave the US, Canada, and Japan out of it – they are developed countries not doing anything under the KP, which is surely something to bash them for – but India? A developing country itself, with smaller per capita emissions than Africa itself? You’ve heard the arguments against China and India being included in the major emitters category. From previous Earth in Brackets posts and if you’ve ever talked to us, our position should be clear: no new treaty should compromise the principles of common but differentiated and historical responsibility. Developed countries need to take the lead in assuming legally-binding obligations to mitigate carbon emissions, and they need to provide support to developing countries so that they may do the same as per their abilities. Developing countries are just that – developing – and they have priorities like poverty eradication and economic and human development to take care of. Continuing with the KP-2 with enhanced ambition, fewer loopholes and more stringent commitments is absolutely imperative and non-negotiable. We have treaties in place to cover both developed and developing country responsibilities: don’t forget the Bali Action Plan and the Kyoto Protocol. These together form our climate regime. The blame game was dangerous on many levels; on the most immediate level it took the heat off the EU, and what’s more, it rolled with its own momentum and painted the EU in a positive light. This twist was more than slightly intentional and served as a powerful political tool in shaping the outcome, for it resounded on an even deeper level: it silently shook the foundations of the FCCC by calling into question what “equity” meant. Enrolling China, India and other developing countries into the same program of obligations as developed countries is a way of redefining common but differentiated responsibility. A US negotiator said that CBDR has “evolving applicability”. What next? Soon we’ll be saying that climate change is AOSIS’ problem and everyone else can wash their hands of the whole affair. Then maybe that carbon is actually good for plants so we should emit as much as possible between now and when the Maldives sinks. The climate regime started to crumble. Maybe if people had been better informed, maybe if the world had received a more truthful message, maybe if public pressure had been stronger in the right ways, then developed countries wouldn’t have gotten away with the blame game and with the skirting around their responsibilities. Media messaging was key in many ways to the outcome itself. So headlines shooting out from COP17’s epicenter in Durban to the rest of the waiting world were infused with accusations against China and India. No number of press briefings or position papers from the Chinese and Indian delegations could change the momentum of the tide. From meeting rooms to civil society constituencies to the media to the rest of the world, the messaging of the political realities of the conference was like a giant game of telephone. The EU’s explicit message of “we refuse to have ambition and we want developing countries to share our burden of responsibility” was somehow buried in the details, warped through the line somewhere and came out to the rest of the world as “the EU is trying to save the climate regime but China and India are blocking them from doing so”. 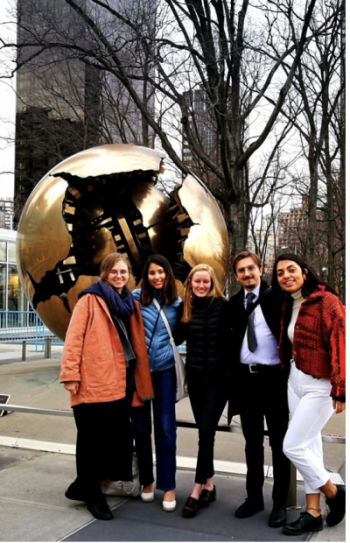 And then, in the final feverish days of high-level segments and urgent negotiations, the “new treaty now” messaging came out as the final blow to civil society’s united message (that never was). Earth in Brackets walked into a YOUNGO (youth constituency) meeting one morning to find the old “I Heart KP” tshirts being handed out. Fine, great, we love the KP. But wait – what is that sticker that is being firmly pasted onto each tshirt before it gets handed out? TREATY NOW, it reads. We ask someone – why are you putting on those stickers? “Well, because the messaging isn’t complete without them”. Oh dear, the youth have been duped as well. Treaty now? We have a treaty now. We have a treaty and a plan of action! If we put our energies and ambitions into properly implementing the KP and the BAP, we’d be on the right track! Don’t fall for their “new treaty” with its crippling conditions, loopholes and lack of ambition! The devil is always in the details! NO treaty now! But alas, it was not meant to be. That day, and the next, and the next, hundreds of youth milled around the conference centers blaring “I Heart KP, TREATY NOW” on their bosoms. And there went any possibility of a united civil society front. And out went new headlines that said things like “Global climate change treaty in sight after Durban breakthrough” (the Guardian). Once all this mixed messaging was out there for people to trip up on and get confused over, it was easy for the rest to happen. Bam, bam, the gavel went down quick as a flash on major decisions. Equity out, loopholes in, ambition gone, all done, all finished, new Platform, new Mandate, the blame still on BASIC and the EU still looking good for taking leadership. It was over long before civil society came to its senses. And we never did come to our senses, because in the end the whole convoluted nature of the conference messaging culminated in the final humiliation: the media headlines of the Durban outcome. “Climate conference ends in agreement”, “Kyoto is saved”, “Hope at last at climate conference”, “Durban conference a success, “Durban outcomes significant milestone”. And on it goes. The earth, in the end, was not even afforded the dignity of having its betrayal blamed on the right people. Messaging is of crucial importance in every word, publication and posting each organization puts out. Blindly repeating a message you heard on the street without reading the text itself could be disastrous. Every interview, every blog post, every article must represent the whole and complete views of your organization, and messaging must be carefully thought over before campaigns are launched. We at Earth in Brackets are most definitely culprits of incomplete messaging ourselves, but we now know enough to at least be aware of this in the time leading up to the next COP. We’ve seen the stakes, and they’re too high. Civil society really weakened itself through misinformed messaging. The media wooed us and we accepted, not realizing that the media was already married to the UN and developed country governments. Where do we go from here? Who do we trust? Man cannot live on bread alone; similarly Earth in Brackets cannot live on Third World Network updates alone (www.twnside.org.sg) in order to be informed in the right ways – or can we?